Telescopes come in many varieties – some of them are better suited for beginners, and others are strictly for the pros. When you’re trying to find the best telescope for beginners, there’s one main consideration you should make. Read our beginner telescope reviews to know more about it. Telescopes with larger apertures are more expensive. While they offer the best image quality, they aren’t always what a beginner needs. When you’re looking for your first telescope, anything with a 50 millimeter or larger aperture is perfect. Pro territory starts at about 80 millimeters. If you want a larger picture of distant objects, you’ll need a larger aperture. Something like 50 millimeters is perfect for looking at the moon, but you’ll likely want 70 millimeters or larger for checking out faraway planets. Reviews are the best place to start your journey when you’re looking for a new telescope. Orion is known for making excellent telescopes, and this just might be their best telescope for beginners. It features a 76 millimeter aperture, where most starter telescopes usually offer a more modest 50 millimeter aperture. This telescope will rotate both up and down and side to side, allowing you to create your own panoramic view of the night sky. This telescope is the ideal diameter for viewing the moon. By filling the view of the telescope with the surface of the moon, you’ll even be able to see the texture of the craters. Comes with a finder site. You can align your view by pointing the red dot directly at the object you’d like to observe. Comes with bonus astronomy software to help you learn as you go. Not designed to be used to view very distant objects, such as the moons of Jupiter. This is the best starter telescope for people who want great specifications on a simple telescope. It’s basic, but it does basic very well. You aren’t getting a plain inexpensive telescope that won’t actually live up to its claims. This is designed for quality at an affordable price, which is exactly what most beginners should be looking for. There are a lot of reasons why many people will find this to be the best first telescope. It’s lightweight enough to be portable, but durable enough for everyday use. You’re getting a 60 millimeter aperture, offering you a superior view when compared to most entry level telescopes. The mount swivels in all directions, allowing you to explore the skies with ease. Optical parts are made entirely of glass, not cheap plastic that will scratch and scuff over time. Includes two different eyepieces which can be set on the accessory tray built into the tripod for easy swapping. Optics are coated with a film that reduces glare and improves contrast. Unlike the other components of the telescope, the finder scope is primarily made of plastic. This really is remarkable for the price. It’s inexpensive enough that most people will find it to be an excellent buy. If you want a telescope you can travel with to avoid the disturbances of city lights, you can easily carry this model up a hill with you. This is, probably the best beginner telescope for people who want to check out the stars from different locations. This is the best telescope for beginners who would like to get a closer look at distant planets. With the 76 millimeter aperture, you’ll be able to get a great view of Jupiter and the moons that orbit it. This is a comprehensive system designed specifically as a learning tool, making it easy to interpret and understand the things you’re spotting through the lens. Comes with helpful guides and a start chart wheel that will help point you in the direction of celestial objects you would like to view. Altazimuth mount is easy to adjust. This telescope works just fine being set up in a single spot. You can change the Barlow lenses to higher magnification. It’s easy to customize this telescope. This isn’t like a toy telescope – it requires real setup and calibration to work. You’ll need to follow the instructions carefully. This is the best amateur telescope. It’s a great starting point for people who want to become serious astronomy hobbyists. It’s configured like a simplistic version of a high tech telescope. You’ll get a feel for using it, and by the time you’re ready to graduate to a heavy duty model, you’ll have all of the basics figured out. Consider this the best telescope for beginners who are hoping to foster a lifelong interest. The specifications on this good starter telescope are insane. It features a 127 millimeter aperture, which is virtually unheard of when it comes to telescopes at an entry price point. Its 250x magnification power is perfect for the size of the aperture, giving you a clear view without warping or distorting your image. This is a high quality, heavy duty telescope that doesn’t require any tools for assembly. Features a high quality German equatorial mount that will allow you to track the movement of celestial objects. Comes with a smartphone app that allows you to view, track, and identify objects. The included software also allows you to print out maps based on your specific location and the time of year, so you won’t have to fumble to find what you’re looking for. Motion controls move slowly, which is perfect for a telescope of this size. It won’t fall and bang around while you’re trying to make adjustments. The weight, size, and shape of this telescope make it difficult to travel with. This is a good beginner telescope for people who want the feel of heavy duty equipment. It’s designed like the serious telescopes you would see at a planetarium or astral observatory, but it’s designed for home use. This one might be a little trickier to get used to because of its intensity. But once you master the use of this telescope, you’ll be able to master any telescope with relative ease. Most telescopes of this variety are very large and very heavy, making them difficult for beginners. This version is compact, so it’s easy to set up and use wherever you take it. The 90 millimeter aperture is sufficient enough for viewing planets and moons, as well as nebulas and distant galaxies. Mak-Cass telescopes are designed to provide vivid, bright images with beautiful contrast and colors. The design of this telescope is optimized for viewing stars. Unlike with other telescopes that place their emphasis on moons and planets, you’ll be able to watch stars twinkle and glow. Comes with a sturdy tabletop mount that’s easy to set up on a windowsill or on the back of your car. It’s just the right size to take camping with you. The tube can be removed and mounted onto a standard taller tripod on occasions where you want to place the telescope at a greater height. Laser finder scope needs to be manually adjusted to suit the viewing habits of the user. This is one of the best amateur telescope who are most eager to look at stars. It works perfectly well with planets, but star cluster and nebula observation are the clear bonuses here. The way that this telescope lets in light will help you spot and zoom in on the most distant stars that you may not be able to catch a glimpse of with other telescopes. On the surface, it looks like this telescope only features the bare minimum. You’re getting a 50 millimeter lens on a standard refractor telescope that comes with 3 basic magnification eyepieces. It comes on a basic aluminum tripod with a multidirectional altazimuth mount, making it lightweight and easy to assemble. If you’re a beginner, the combination of these simple features might make this telescope the ideal place for you to start. Unlike some refractor telescopes that show the user the image upside down, this one is calibrated to convert the image to right side up. You’ll get an accurate view of objects as they actually appear. Since all of the features are very straightforward, it’s easy to adjust this telescope. There are no mirrors to collimate, and it only takes a few seconds to swap out the eyepieces. Anyone can set this telescope up, and since it’s lightweight, you might even want to take advantage of that simplicity by travelling with it. Aperture is slightly on the small side, though it’s still great for viewing the moon and some of the closer planets. 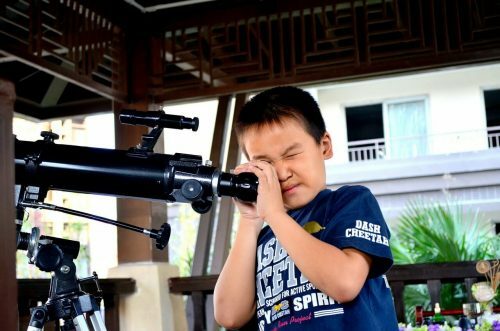 This is the best starter telescope for families with children. It’s basic enough for children to learn, and it’s not too expensive to trust them with. The features are very basic, and it does all of the things you would want a starter telescope to do. You won’t be paying for bonuses and extra eyepieces that a beginner won’t be using. This is the perfect way to try a telescope out with your children to see if they actually like it before splurging on a more expensive model. Gskyer is a little known telescope brand that uses German space technology to craft all of their products. The end result is telescopes like these that bring great technology to the home consumer at a reasonable price point. The 70 millimeter aperture is perfect for viewing most of the things you’d want to view, and all of the glass optics are coated to automatically adjust the brightness of the stars to a level safe and comfortable for observation. This telescope is designed for easy travel. It even comes with a carrying bag that safely stores the telescope and all of the accessories. The view you’ll get from the aperture is great enough for amateur astrophotography if you’re interested in snapping pictures of the things that you spot. Comes with three eyepieces that offer different magnifications, and they’re easy to put on and take off. This telescope is designed primarily for viewing planets. You can view stars with it, but they won’t be as clear. This is a great starter telescope for the explorer who intends to take their telescope with them on their journeys. Hiking, camping, and even moonlit fishing trips will be more fun when you have this telescope in tow. If you live in the city and you aren’t able to see much of the sky due to light pollution, you’ll want a telescope like this that’s easy to carry with you. This is the top rated beginner telescope, and it’s very easy to see why. Celestron makes great products, and they knocked it out of the park with this particular telescope. This telescope practically does all of the work for you. Unlike complicated professional telescopes that require heaps of manual adjustments, this one features a permanently mounted spotter which makes it easy to get the image right on the first try. Everything comes to you already assembled. It’s ready to use right out of the box, and doesn’t require any calibrating. Optics all come back to you right side up. You can use this telescope to view everything, even mountains, exactly the way they appear to the naked eye. 70 millimeter aperture with 90x magnification creates a crisp image every time. No blurry glimpses of the moon – you’ll be able to see the texture of the craters. Only comes with the basics you need to get started. Professional grade lenses and eyepieces need to be purchased separately if you outgrow the ones that come with this telescope. This offers the right quality at the right price. You’re not going to be able to find the best beginner telescope better than this – especially considering how affordable it is. The mount is perfect for tracking objects, and the optics are superior to the optics of similarly priced telescopes. When looking for the best telescope for beginners, what’s the most important is that you’re purchasing one that offers the features you know you’ll use at a price you can afford. There are plenty of great beginner telescopes for everyone. Reflector vs. Refractor Telescopes – What is the Difference? December 20, 2016Comments Off on Reflector vs. Refractor Telescopes – What is the Difference? Likehubble.com is a participant of the Amazon Services LLC Associates Program, an affiliate advertising program – it is designed to provide an aid for the websites in earning an advertisement fee – by means of advertising and linking to Amazon.com products.